This report is part of #NBCGenerationLatino, focusing on young Hispanics and their contributions during Hispanic Heritage Month. 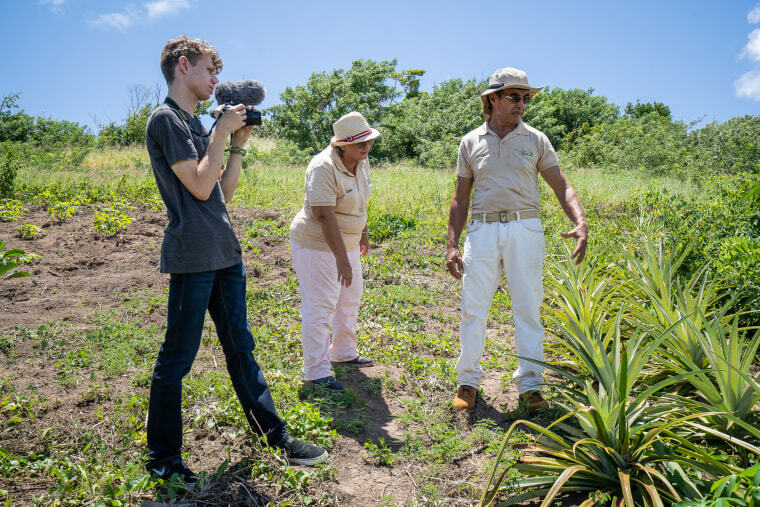 In his quest to answer it, Nolla Marrero founded E-Farm, a digital platform that connects farmers across the island with consumers. Nolla came up with a website that showcases farmers' products and then coordinates the purchase and delivery of the sustainable and organic produce and products. Promoting the production and sale of island-grown produce is significant, since Puerto Rico currently imports about 85 percent of its food, a situation that became starkly evident following Hurricane Maria, when it was hard for residents to obtain food. In addition, farming and food production helps stem the island's high unemployment rate and tough economic situation. According to statistics provided by the governor's office in 2016, farm income grew 25 percent to more than $900 million from 2012 to 2014. The amount of acreage under cultivation rose 50 percent over the past four years, generating at least 7,000 jobs; as of 2015, 23,000 Puerto Ricans had farming jobs. But E-Farm’s growth was halted when Hurricane Maria ravaged Puerto Rico. The storm devastated about 80 percent of all the island's crops and severely damaged the island's dairy industry and plantain and coffee plantations. “Agriculture is one of the industries that can recover the quickest,” said Edwin Almodóvar, director of USDA's Natural Resources Conservation Services in Puerto Rico. “Right now, I'm focusing on three things. First is to launch E-Farm. The second thing is to find good colleges. I'm looking for a wide variety of colleges and I'm just learning from the different things that I like and dislike,” said Nolla Marrero. He’s also trying to figure out ways to use some of the photos he has taken of E-Farm farmers for fundraising purposes. For farmers, it's been a game changer. "It surprised us a lot. We thought it wasn't going to work. And yes, we ended up selling a lot," Lydia Díaz Rodríguez, a farmer at Yucae in Yabucoa. "We hope that soon we can start selling the 'pasteles,' the 'alcapurrias,' we're already selling our yuca bread, meaning that we are recovering little by little." Geraldine Cols Azócar, Nirma Hasty and Brock Stoneham contributed.